Hoang is a member of the Product Science – team Health, where she develops content for our awesome and important Health reports. 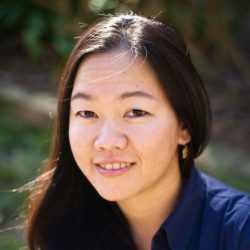 Hoang received her bachelor’s degrees in Neurobiology and English Literature from University of Washington. Fascinated by the brain, she went on to get a PhD in Neurosciences from University of California, San Diego, where she spent a lot of time trying to discover new types of brain cells (and she found one!). After her PhD, she completed a postdoctoral fellowship in Alzheimer’s research to understand the genetic basis of that devastating neurodegenerative condition. Prior to joining 23andMe, Hoang was a curation scientist at Illumina and an NGS scientist at Thermo Fisher. She has made a switch from studying the brain to studying genetics because DNA is awesome and powerful! Our genes control everything, including our brain.